Mary, how did you come to specialise in Deep Oscillation? “My Sister, Julie Soroczyn is a qualified Fitness Class Instructor and Sports and Holistic Massage Therapist. In 2004, she had the opportunity to purchase a Hivamat Deep Oscillation unit through a Sports Lecturer she knew. He extolled the virtues of the therapy and told Julie how effective it was for speeding up the healing process, non-invasively, whilst saving her own hands at the same time, as no pressure was required to apply it through the vinyl gloves. Julie began to see impressive results with pain and swelling reduction, greatly enhancing mobility in both acute and chronic conditions. Word-of-mouth recommendation meant she began treating patients with a host of conditions ranging from achilles problems, arthritis, acute and chronic back pain, dead legs, groins strains, tennis & golfers elbow, post hip and knee ops. Even professional footballers began seeking out her magic hands for injuries their club Physiotherapists could not sort quickly enough. It is now used in many Premier League Clubs and Carl Froch the Nottingham Boxer endorsed the therapy in 2007 when he used for troublesome swelling after ACL surgery. Julie was in fact, the only therapist to be using the therapy in the UK at that time. Consistent and effective results fired up her passion to learn more about the therapy and its various applications. She felt she was merely scratching the surface of the potential of this gentle therapy and how it could help so many, reducing the reliance on anti-inflammatory and pain medication. After numerous calls to the manufacturers in Germany and asking an array of questions, they invited her over to shadow Wolfgang Walder in his clinic. Wolfgang was one of the Physiotherapists involved in its development in the late Eighties. At the end of a very successful visit, where Julie witnessed its use on the face and over eyelids and many other applications her confidence grew in its application and safety. Julie was very happy to accept their offer for exclusive distribution for Deep Oscillation in the UK. Once home, she asked if I would like to go into business with her. My background is in office management and accounts with an avid interest in technology and healthcare and a tenacity for problem solving! Skill sets entwined, we embarked on our mission to improve UK healthcare pathways with this non-invasive therapy. Deep Oscillation is a patented therapy which is delivered via massage or applicators. A therapeutically beneficial electrostatic field is created in the tissue segment undergoing treatment. As the vinyl gloved hands or applicators glide over the tissue, the tissue layers are attracted and released up to 250 per second (250 Hz). Deep Oscillation permeates a clinically proven depth of 8cm. No pressure is required to achieve effects making it an ideal treatment for Lipoedema. It is gentle, relaxing and pleasant. Pain is significantly reduced, inflammation suppressed, the oedema element of lipoedema is reduced, bruising resorbs. Where present, fibrosis is tackled effectively, limbs feel lighter and mobility is enhanced. In treatment, the patient holds a titanium element in the palm of their hand or it is placed between their toes. The Therapist is connected via an electrode adhered to their arm and they put on a pair of vinyl gloves which act as the semi-conductor for the therapy to work. Powder is applied to the area, which helps the therapy to glide over the skin once the massage begins. A normal treatment is around 30 minutes and is very relaxing, reducing pain and improving mobility within 10-15 minutes. Who is providing Deep Oscillation in the UK? Are there any mobile Therapists? You can see a full list of therapists, here. Many Private Therapists offer a mobile service, and all Deep Oscillation Therapists are friendly and approachable and work closely with PhysioPod to create bespoke therapy cards for those patients wishing to proceed with their own unit purchase. What sort of fields of application does Deep Oscillation prove helpful in? Since Deep Oscillation possesses anti-oedema, lymph drainage, anti-fibrosis and detoxifying properties, it prepares the tissue for liposuction, makes liposuction more effective and durable and protects against adverse effects of the body sculpting procedure. Because it can be used at a very early post-operative stage, the healing process is accelerated, reduced pain, bruising and swelling, scar quality is improved, and local inflammation is inhibited and stopped over a sustained period. Are you seeing more patients presenting with Lipoedema? We became aware of Lipoedema back in 2009 via MLD DLT Lymphoedema Therapist Lynora Kennedy and then more so when we were asked to exhibit at Conferences with Lipoedema UK, Lipoedema Ladies and Talk Lipoedema. We have now met hundreds of ladies with Lipoedema, with some becoming close friends. Do patients come to you who have not been diagnosed with Lipoedema but you recognise the disease is present? Yes, we spend a great deal of time educating all kinds of healthcare professionals about Lipoedema at Conferences and various meetings. Therapists who did not know that Lipoedema existed do when they receive their training and information packs from us. Many Therapists often report that patients have arrived displaying symptoms but they were not aware that Lipoedema was what they had, our Therapists now address this, especially Physiotherapists. Most have been incorrectly diagnosed by their GPs with simple obesity and sent home with diets sheets to follow! They are now advised through our Therapists to get a diagnosis/referral as soon as possible. Can you describe the symptoms Lipoedema patients frequently have when they come to have the therapy? The symptoms described are painful heavy legs, with restricted movement and a general lack of confidence. It’s important to note though that we have witnessed a feeling of growing camaraderie within the fabulous support groups/Instagram. We see positive change in sufferers, as more get the diagnosis and support they deserve and as they learn more ways to self-manage symptoms. What would you say to a lipoedema sufferer considering Deep Oscillation? Go for it! There is nothing to lose and symptom relief to gain. Can all stages of Lipoedema be worked upon using Deep Oscillation? “After myself and my mother were diagnosed with Lipoedema last year we found huge benefits from receiving regular manual lymphatic drainage treatments. As good as that is, financially it just isn’t possible for us to go weekly. So when the Hivamat was recommended to us a few months ago by a well-respected MLD therapist, we hadn’t heard about deep oscillation therapy and wanted to find out more. What are the contraindications for Deep Oscillation? Are there any side effect/possible reactions to treatment with Deep Oscillation? Acute pain sensations in the area undergoing treatment, mostly three to four hours after the conclusion of treatment. These complaints usually persist for several hours before they ease all of a sudden, often after urination. Increased desire to urinate, it is possible that colour and smell of the urine are entirely different. Hypersensitivity of the skin in the area of treatment; may persist up to several days. Rise in temperature (local, rarely). A huge thank you to Mary for giving up her time to fill us in on all things ‘Deep Oscillation’. We can vouch for the ‘gorgeous sisters’ comment – both Mary and Julie are fantastic and extremely professional. 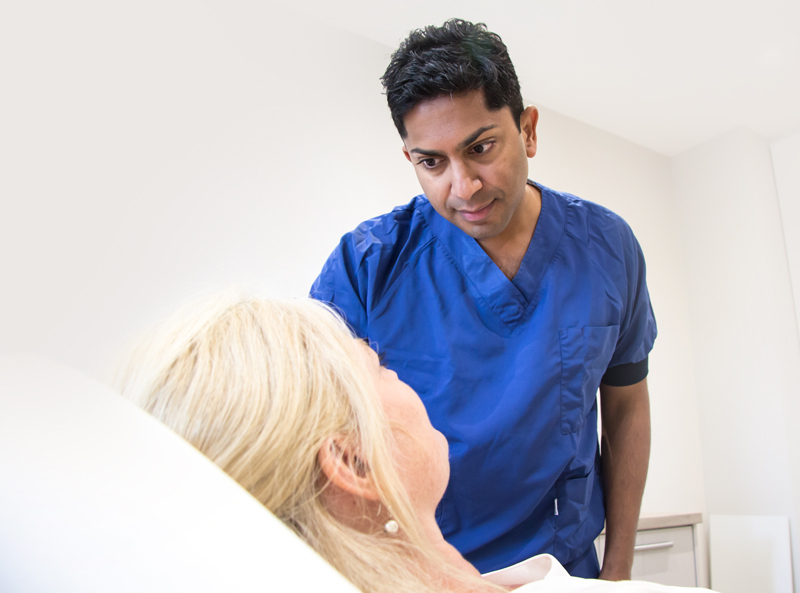 If you’re looking for an alternative option for pre or post surgery then definitely speak to them."